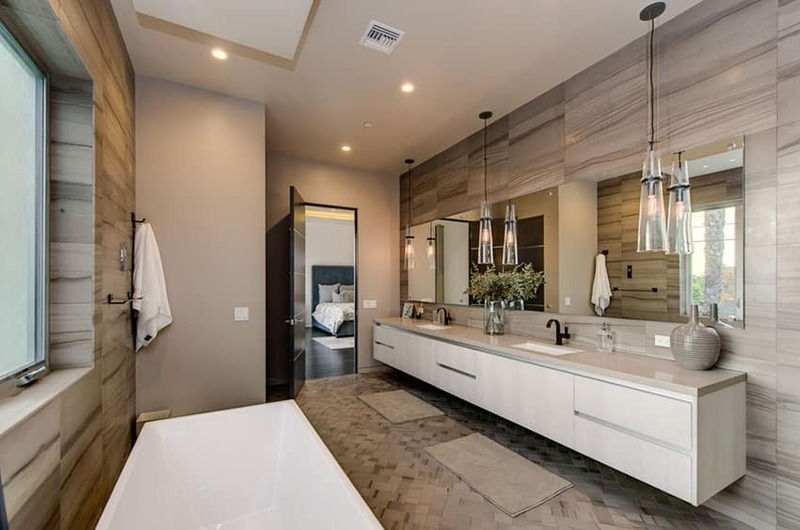 In this gallery of bathroom pendant lighting you’ll find a variety of styles to give you design ideas for your own home. Pendant lights are a great alternative to regular light fixtures and can add a lot of style and function to your bathroom space. In the picture above is a contemporary master bath with freestanding bathtub and beautiful pendant lights with hanging glass. 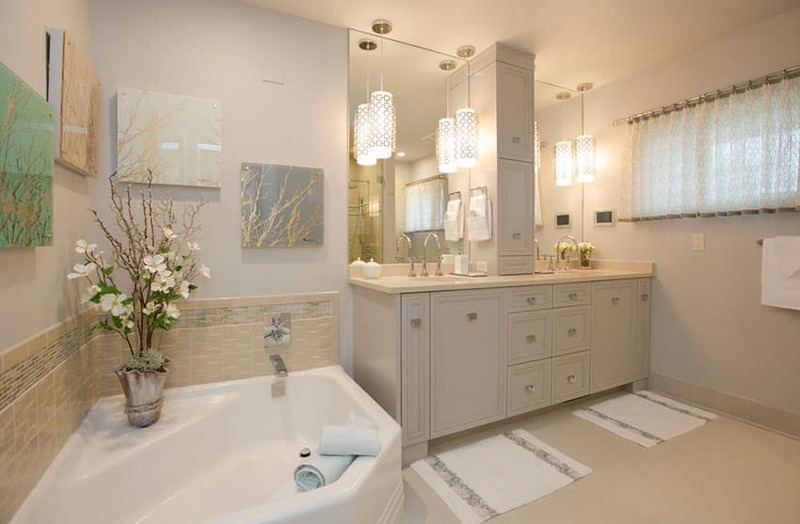 The white bathroom vanity is equipped with a vessel sink, powder room makeup area and wall sconce lighting. Pendant lights are suspended from the ceiling by a cord, rod, or chain. There are several common types of pendant lights. 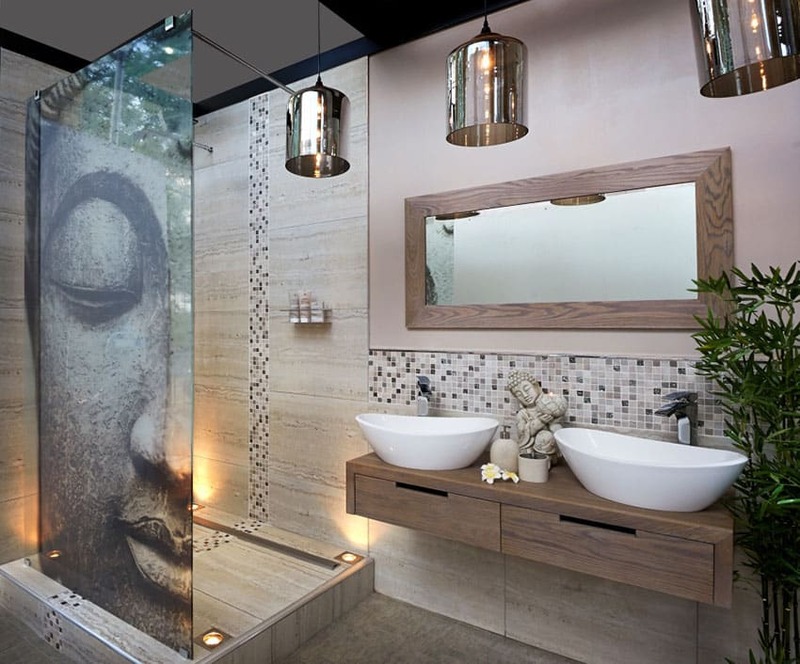 Additionally there’s a variety of styles to match your decor and bathroom design. Mini pendant lights can be used solo and are great for redefining a space due to their ability to create focal points in a room. Mini’s are the smallest type of pendant light and are a popular choice for adding ambiance and enhanced beauty to a space.When several mini’s are grouped together in a single fixture they are often called island pendant lights. Island pendants are usually grouped with two or three light sources. Multi-light pendants are a fixture that has multiple hanging lights on one unit. These types are not as widely used in bathrooms and are more likely to be seen in kitchens and family rooms. Multi-light pendants are versatile and appealing. Other types of pendant lights include: Up light pendant to direct lighting upwards. Down light pendant to direct light down. Drum pendants are cylinder shaped and are a versatile choice that works with almost any room style. 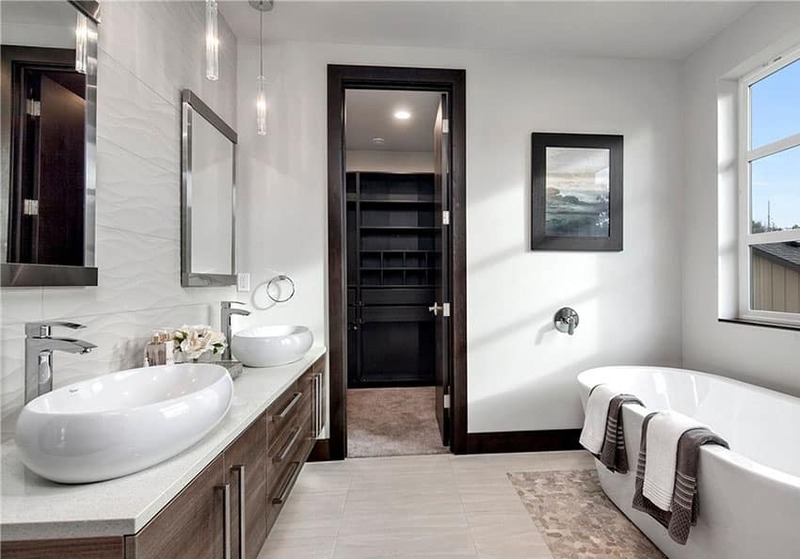 This modern master bathroom is reminiscent of a luxury spa with its stone accent wall, vessel sink and gorgeous down facing pendant lights. 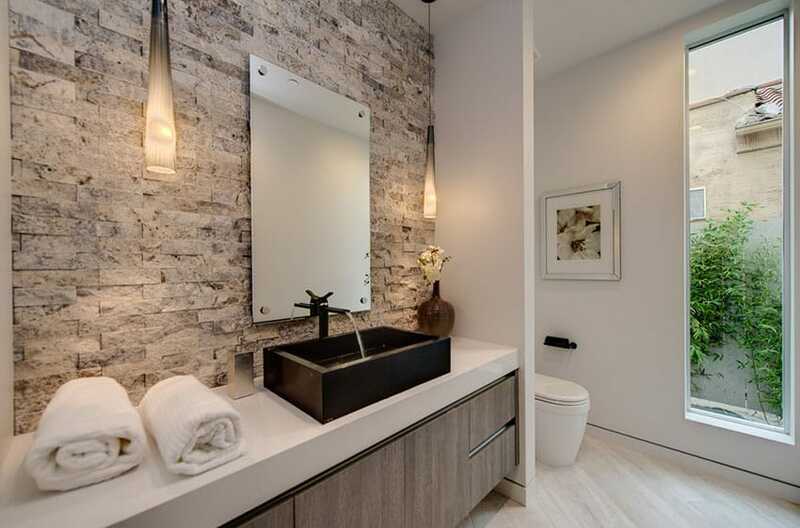 A contemporary bathroom with globe pendant lights in one unit that add a lot of drama and beauty to the vanity area. 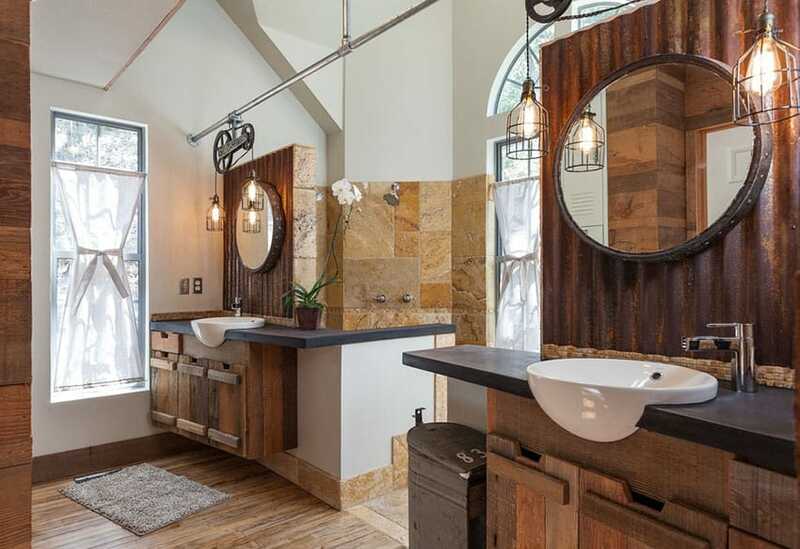 This charming rustic dual sink bathroom has rough wood cabinets, wood flooring and multiple wire cage pendant lights on an old fashioned pulley system. 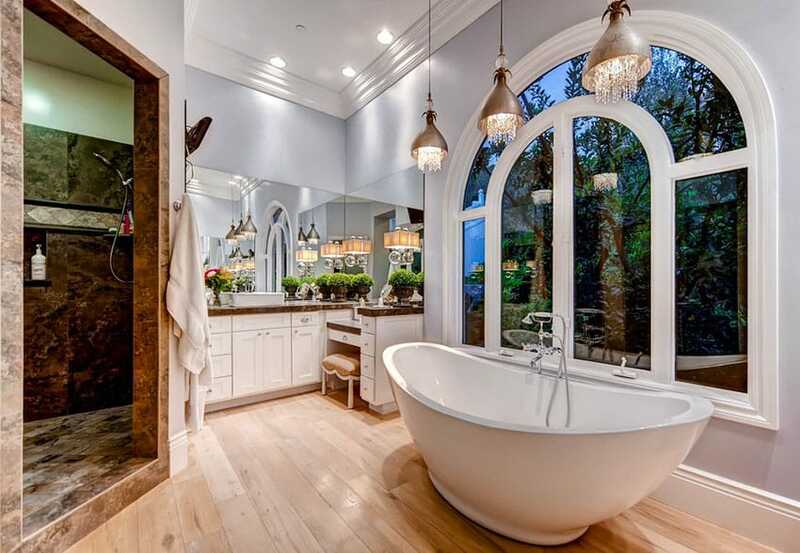 A bright traditional master bath with cylinder shaped pendant lights, large soaking bathtub and limestone floor tiles. 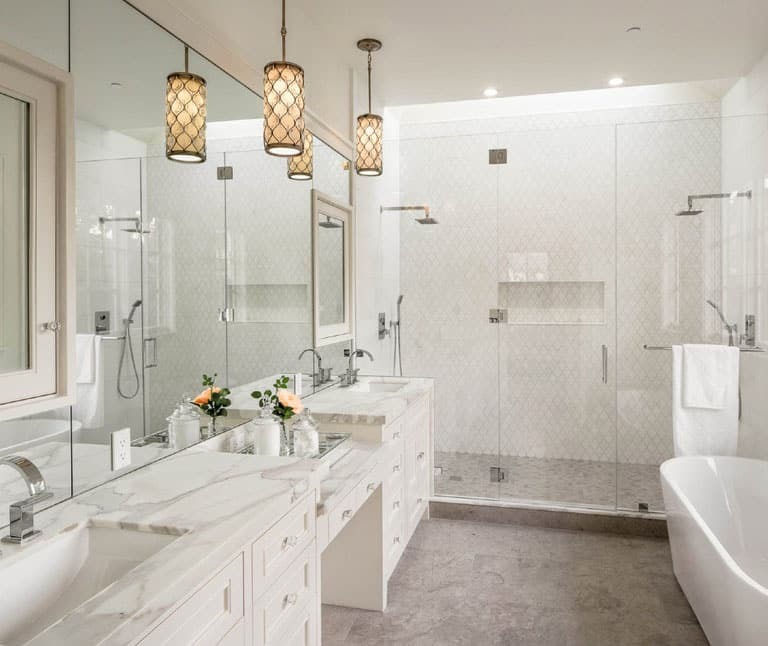 This white master bathroom has marble counters, white cabinetry, dual sinks and burnished brass pendant lights with a chain link design over a yellow diffuser. 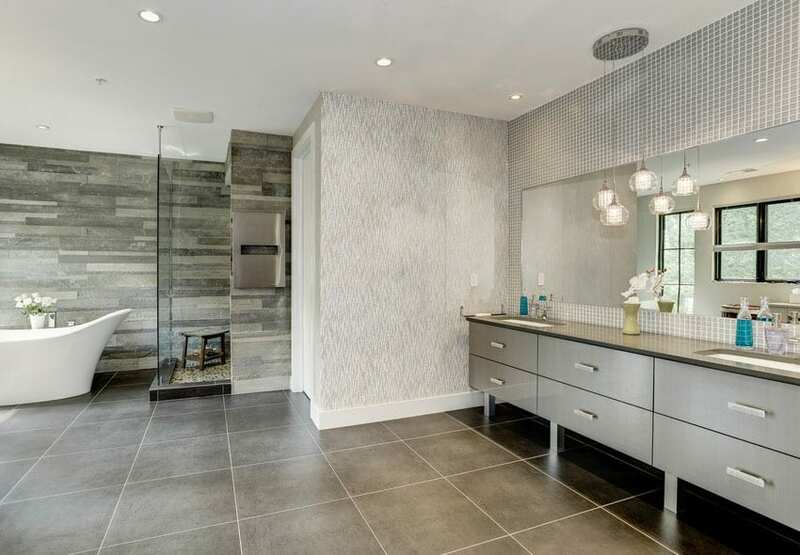 Contemporary master bath with polished nickel pendant lights with crystal glass tubes above two oval vessel sinks. 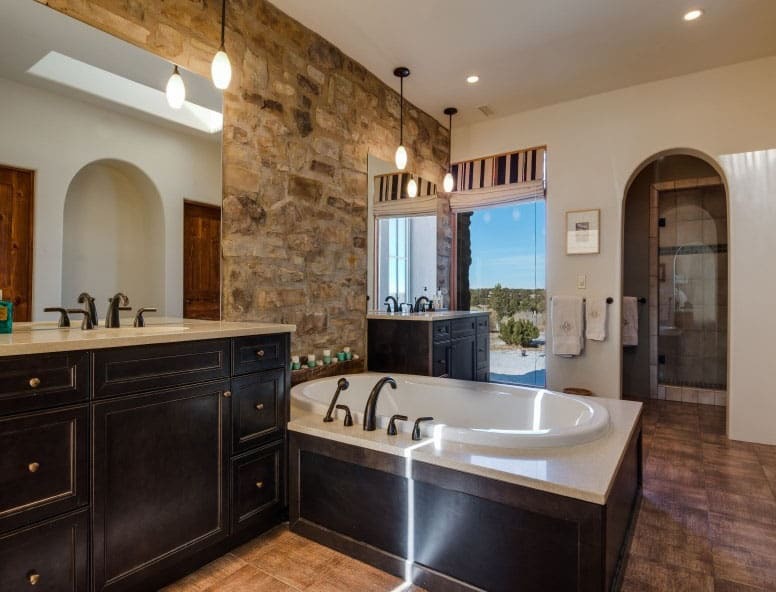 Luxury master bathroom with rough rock wall, large enclosed bathtub and dark color oval pendant lights. 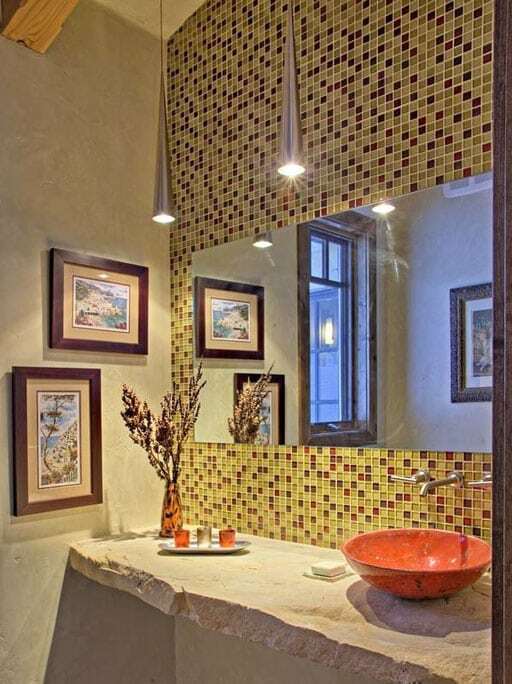 Stylish bathroom with a red decorative vessel sink, square mosaic tile and brushed metal cone shaped pendant lights. 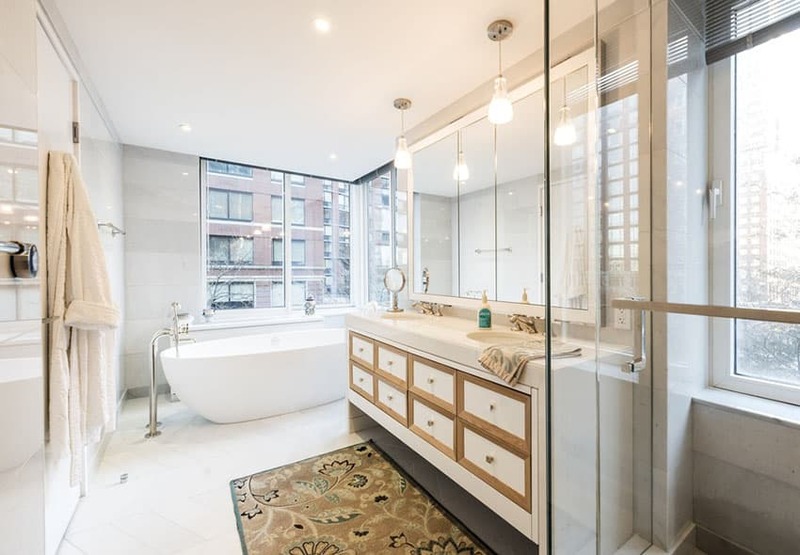 This light and bright city apartment bathroom features an attractive contemporary acrylic bathtub, and brushed metal pendant lights. 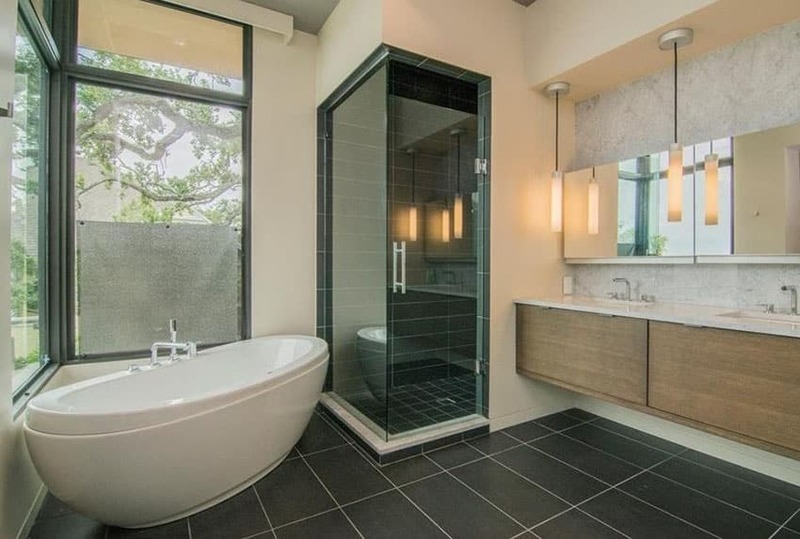 This contemporary master bathroom has three retro cone shaped pendant lights that bring a stylish look to the space. 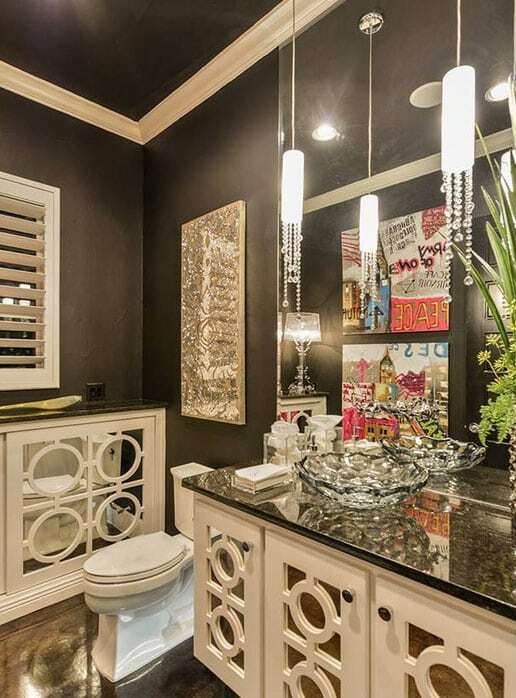 This glamorous dark walled bathroom is made even better by the elegant pendant lights with hanging glass beads. This master bathroom has tons of natural light, but is enhanced even more by the soft glow from the mini pendant lighting over the vanity. 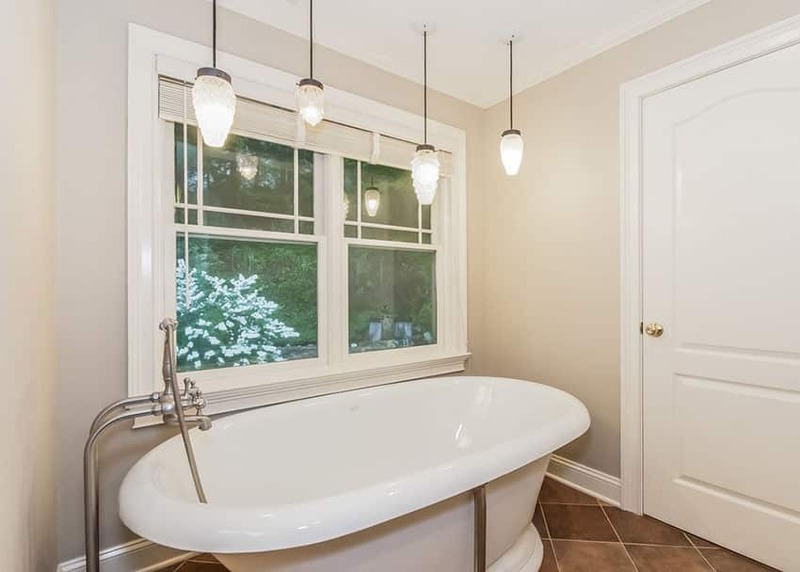 This pedestal bathtub is illuminated by four nickel beehive pendant lights providing plenty of character to this otherwise bare bathroom area.